Over the past few weeks, we’ve lost two major comedic forces, Robin Williams and Joan Rivers, both of whom brought great joy and laughter to our world. Accolades and impact statements have flooded the Internet, along with heartfelt condolence messages. How wonderful for their families to feel this outpouring of love and respect. Yet away from the bright lights of Hollywood, every day, thousands of families experience the loss of loved ones ~ through suicide, tragic accidents, and illness. Often these families have made great sacrifices to care for their loved ones. Medical bills have crushed them. Mounds of insurance paperwork have buried them. Some are left with crushing debt as in the case of the Mason family after the unexpected death of their daughter, a recent nursing graduate. Many become ill themselves from the stress, worry, and physical and emotional toll of caregiving. Most are without any significant resources to supplement the care they provide or for support services for themselves. 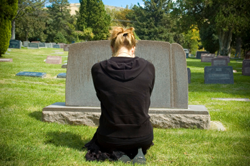 With the loss of their loved one, especially when that loved one has suffered extensively, can come feelings of guilt and shame for the strange sense of relief they may experience as a companion to their sadness and grief. They judge themselves and, often, others judge them. Where are the accolades, the support, and the sympathy for these unsung heroes? So as we mourn the loss of our Hollywood stars and send condolences to their families, let’s also remember to consider the neighbor, co-worker, relative, or friend who also may be suffering in the shadows of loss and grief. A hand-written note, an invitation to lunch, or a gift certificate for some self-care are wonderful ways to let our unsung heroes know that, while there may not be headlines or newsfeeds filled with their loved ones’ name, we know they are in pain and we care.